Published on 16 March 2012. 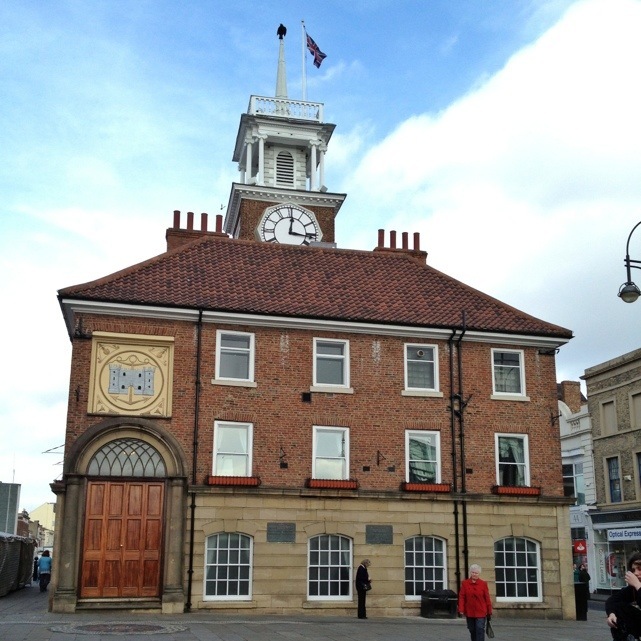 Today’s photo is of Stockton Town Hall, which sits in the middle of Stockton High Street and dates from 1735 – some 41 years before the United States was founded! It was in this very building, in 1810, that the construction of the world’s first passenger railway was initially proposed. That plan came to fruition some fifteen years later, with the opening of the Stockton and Darlington Railway. Stocktonites often claim that their high street is the widest in the country – a fact I first learned some eight years ago when an elderly lady chose to share it with me whilst we both queued for blood tests. Ever since, I’ve wondered quite what the parameters for the claim are: I think I know of several wider commercial streets in the UK, not least Lord Street in my home town of Southport. The claim is repeated on countless websites, yet none of those I’ve seen seem to properly define their terms. I thought for a while that it was, perhaps, the widest street called “High Street”, but that idea appears confounded by the assertion on some sites that it’s the widest in the UK, but the third widest in Europe: it seems unlikely that there are too many “High Streets” on the continent. So – can any of my readers explain the origin of the claim? This 1,569th post was filed under: Photo-a-day 2012, Stockton-on-Tees.